Deck the halls with salt and iron! Stands has launched their Supernatural Holiday Shop – and we’re not sure what to buy first! Along with the re-release of products from past campaigns, including Rachel Miner’s “Be the Clarence” and Rob Benedict’s “Rock God,” there is plenty of new merchandise as well! 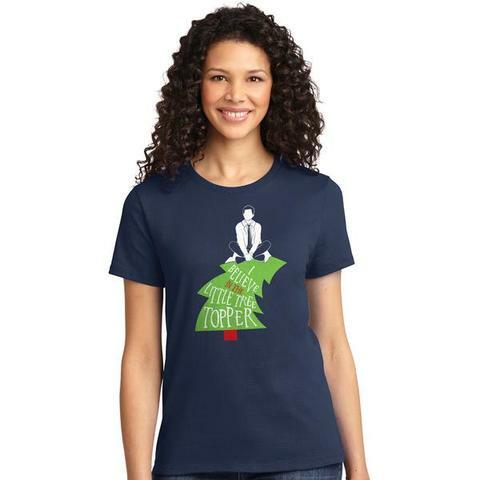 They’ve introduced three new holiday themed shirts – one with our favorite moose, one with our favorite car, and one with our favorite tree-topping angel. A portion of the proceeds from the sales of these shirts will be going to Random Acts. If you were a fan of the 2018 “Women of Supernatural” calendar, Stands has decided to keep the tradition going by releasing a new calendar for 2019. The theme of this calendar is “In This Family,” and it’s comprised of pictures gathered or taken by the women of Supernatural. And, like with last year’s calendar, 100% of the profits will benefit the Jacmel Children’s Center in Haiti. For those of you who have been waiting for the release of enamel pins (or if you’re like Kim Rhodes and just enjoy getting stabby), your wait is finally over! Stands has released pins with designs from four different past campaigns – “SPN Love,” “WaywardAF,” “You are Not Alone,” and “I Wish For This.” A portion of the proceeds will benefit Random Acts. Plus – New Wayward Campaign! Katherine Ramdeen has also launched a new Wayward campaign, “My Super Power is Compassion.” The design beautifully marries the Wayward symbol with the Rod of Asclepius, an international symbol of medicine and health. The website boasts “This shirt tells the world that you care a supernatural amount about the world around you.” A portion of the proceeds will benefit TrapKing Humane, an organization that strives to humanely manage feral cat colony populations. This shop will remain open through December 5! What will you be splurging on this holiday season? Let us know in the comments below! “Main Street Electrical Parade” to Return to Disneyland on January 20!